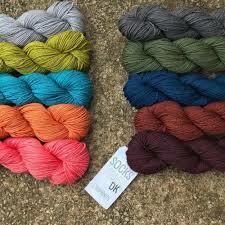 Rachel Coopey our favourite sock designer has a beautiful range of DK and 4 ply yarns with books and patterns to match. A great sock yarn in lots of fab colours, but is also ideal for a jumper or fine project for yourself. Amazing colours and softness, ideal for socks or that jumper you can keep wearing on and on!